The J2EE tools contribution offers tools to create, import, export and exploration thru J2EE modules including EAR, Application Client, Connector, EJB and Web projects. This document can be used as reference for a user with a new workspace or an existing workspace. In the following bullet points various simple tasks within the J2EE tools will be explained. The sections themselves are not inter-related and can be run independent of the others. Each module has its own wizard; however, for usability reasons they are all very similar. Because of this only the EJB Project Creation will be covered in detail in this document, but the same principles apply for all modules. 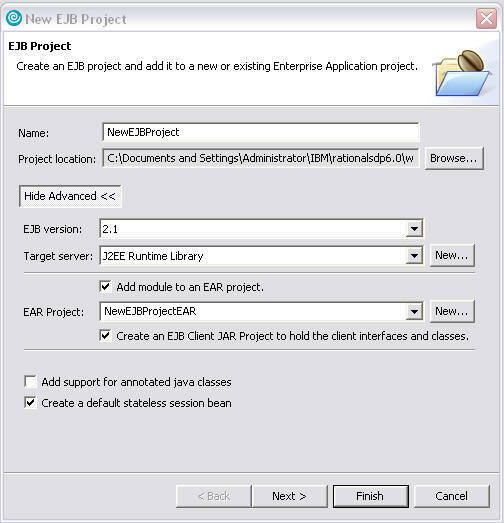 Once you have selected EJB Project from the basic Project Creation Wizard hitting "Next" will take you to the EJB Project Creation Wizard. This wizard pictured below allows the developer to enter a "Project Name" as well as a variety of other J2EE specific information including possible EAR which will contain the EJB as well as a target server. The user can now create the project by selecting "Finish". 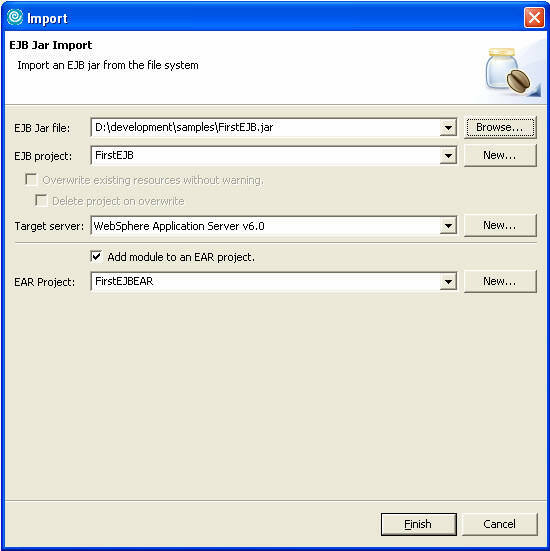 The EJB Import wizard comes up as shown in the figure below. 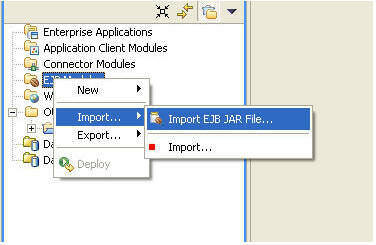 Select the “EJB JAR file” by using the “Browse” button and navigating to the JAR file to be imported. 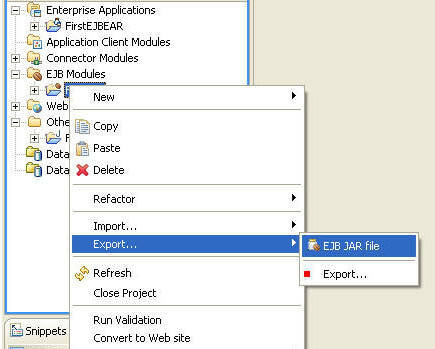 or right click on the EJB project to be exported under the EJB modules in the Project Explorer and select Export -> EJB JAR file. 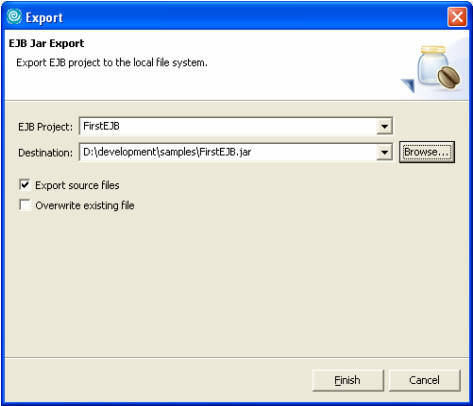 EJB Export wizard comes up as shown in the figure below. Select the “Destination” by using the “Browse” button. You are also able to change the project which you want to export by selecting on the drop down combo box under the "Project:" heading. To complete the export simple press finish. 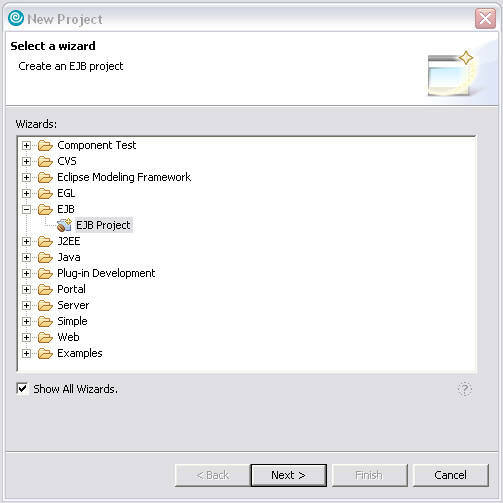 Export of other modules like EAR, Application Client, Web and Connector projects is also supported and can be done in a similar way, as a wizard is available for each module type. 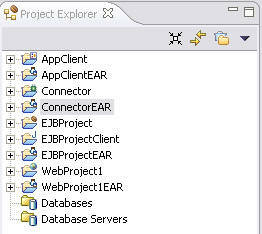 The Project Explorer is useful J2EE group navigation view. The view can be launched by selecting Windows->Show View->Others->J2EE -> Project Explorer. The Project Explorer has two basic layouts determined by selection of the folder grouping button located at the top of the view . When selected, as seen below, the J2EE projects in your workspace will be group under their appropriate J2EE modules. Simple Java Projects and other non-J2EE projects will be found under the "Other Projects" group. If a user would like to see all project ungrouped simply deselecting the will show a view seen below. The Project Explorer also provides a framework of actions which are contributed from the individual objects to perform operations, open editors and do a variety of other work on the projects and their contents as seen by the example implementation below.